The floodlight module is a powerful unit for floodlighting the areas of contamination or radiation. 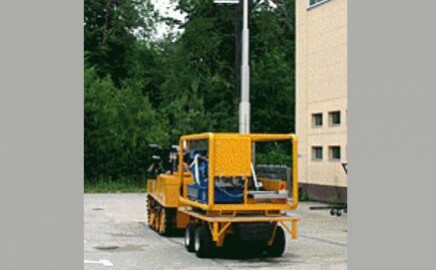 A battery of four 2000W halogen floodlights is mounted on a telescopic mast. The floodlight head can be turned and tilted, and each lamp can be switched on and off independently. As opposed to the other modules, this module is autonomous, i.e. all control functions are directly on the module itself. the SMF is then free to deal with other operations.